Pyramids in the Bermuda Triangle — Fact or Fiction? The Bermuda Triangle has always attracted its share of conspiracy theories. A while back, we posted an informative video about an interesting situation that was developing in the Bermuda Triangle region. According to the video, huge glass pyramids on par with the biggest in our world were discovered beneath the ocean there. You can view the original posting and view the video at our article Pyramids of Glass Found in the Bermuda Triangle. 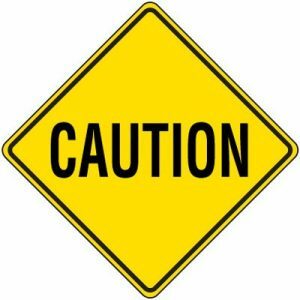 When we posted the article, it was mainly just us passing along something we thought might be interesting to our readers. However, after perusing our traffic and search results, we can see that there a lot of people very interested in this. So, we felt that it was important to revisit this news item and forage into it in greater detail. Obviously, if this find were legitimate, it would be an awesome archaeological event. Many believe that the Bermuda Triangle is actually the site of the lost continent of Atlantis, and there is tons of speculation about a highly advanced civilization that lived there. Reasons for why the lost continent became submerged run the gamut of conspiracy theories. Everything from aliens to pole shifts can be found there, and we won’t waste your time getting into all that right now. What we can tell you is that upon fact-checking this discovery, the problem is that it is impossible to corroborate any of the data. Once again, if this were true, it would have certainly shook up the archaeological world, but there is not one single article, other than the ones in question that surround this video, talking about it. It was not reported in the media in any way, shape, or form. 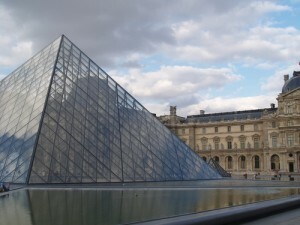 The rumored Bermuda Triangle pyramids are similar to the famous glass pyramid at the Louvre in France, made famous by Dan Brown's "The Da Vinci Code" novel. Except its underwater and much bigger. work beneath the ocean. So, naturally, a find like this only adds to that. 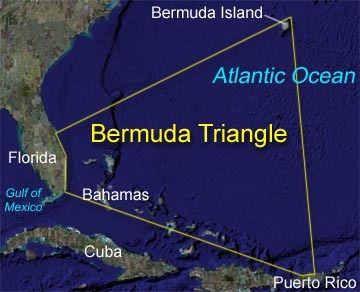 The Bermuda Triangle legend has been examined by many conspiracy sites before. All we’ll say about it is that it all depends on who you believe. Statisticians have looked at the data and basically worked things out that the rate of disasters for ships and planes was no greater than any other region in the world if you take into account the amount of traffic in the area. Supporting this theory is that the Bermuda Triangle has not been a problem for decades. Does this mean that whatever was at work there has gone dormant? Or is modern technology capable of preventing these disasters from happening? Lastly, could it be that it was all just a legend to begin with? Let us point out that Common Sense Conspiracy does not necessarily think that just because it was not reported in the media or recognized by major archaeologists that it must not be true. Certainly there are situations in this world where things are covered up. At the same time, having no sources to back up the information makes it hard to accept it as fact as well. So, what we are saying is that there is no way to corroborate this story. That makes it impossible for us to say that is a true conspiracy or not, but we want our readers to have the facts, especially in something like this that attracts a lot of casual interest. O: Oh Hell No! Honeyboo-boo! What ish You Talking About!!!!! Logic everyone. Logic and reason. Why would the greatest archeological find in recorded history be covered up? There is no reason to cover it up. The fact that there is no information on the subject is the proof that it is nonsense. The lack of any evidence, articles, stories, or discussion amongst professional scientists should be enough to convince any reasonably intelligent person to come to the conclusion that this whole story of glass pyramids is just that, …….a story. C’mon now people. Use the brains you were given. Agreed, Archaeologists have reported every find of a found “lost” city thus far, even when they contradicted established beliefs about human civilization, so I don’t see much reason as to why they would cover this up if it were real. There are cities that flooded out as the oceans rose or buried as sand or Jungle moved in, but when you do the math for how low the water would need to be for these to have once been on dry land the idea becomes untenable. Sounds like someone trying to sell crystal healing books or some nonsense. hey szipka geza… first of all -dumbass-who gives you the right to nuke others, is it simply because we are arabs!!! muslims!!!! are we less than your race ???? or you are from a superier planet. shut the f**k up please and stop what ever you are using, clearly it’s not good for the empty space between your ears, learn english … and most of all learn how to be civilized, cause obviously you belong the jungle next to the other abes and repltiles you belong to. Dude, I’m a reptile. that’s not cool Yanal. First of all, we must take note of the American naval stations installed along the south-eastern coasts of Florida; mainly West Key and Kings Bay (Naval Air and Submarine facilities). We simply cannot discard the plausibility of such discoveries of these spectacular “crystal pyramids”. If indeed they were discovered sometime around the 1960’s, I would suggest they were bulit as US military points of interest, posibly relating to the Cuban middle crisis? Furthermore, let us take a closer look at the practicality an use of such structures… Pyramids are geometrically proven to be superior to earthquakes and/or sea tremors. This means that the structure would never collapse or cave. In addition to its geometrical shape, the central point of focus is the spiked top. If indeed the pyramid had a hole in the top and “frequency” like properties, perhaps this object is some sort of transmuting device. Like the once golden roped pyramids in Egypt, gold and crystal are excellent conductors of electricity. A slanted structure would certainly deflect detection by basic sensors and sonars; not to mention that the electroconductivity would cause abnormalities within the water. (remember those electronic malfunctions people so mysteriously experience…) However all this information is very exciting and brain teasing, but facts are facts. We simply do not know if this discovery is accurate or not. What I DO know, is that the military uses HARP like technology and low pulse emitters for sonar testing and technology expansion. It Should be no wonder or surprise as if the military is conducting covered opperation for further drums use. Is the Bermuda triangle really an underwater area 51? Oh, and people, remember all that UFO mumbo jumbo about Nazis and levitation? It’s called opposite polar magnetic forces. Stick two discs together and spin them with opposite polar force. Remember what happened when we tried to put two magnets together with opposite polars? Now spin that around really fast like our planets orbit: you get gravity and a naturally occurring gyrostabilization… And levitation. Bye now, and remember kids, life and matter are not what is given; but as perceived. Interestg note abt magnetism, crystals i feel r an underutilized underdeveloped technology for sending mssgs , energy& spiritual presence& more.